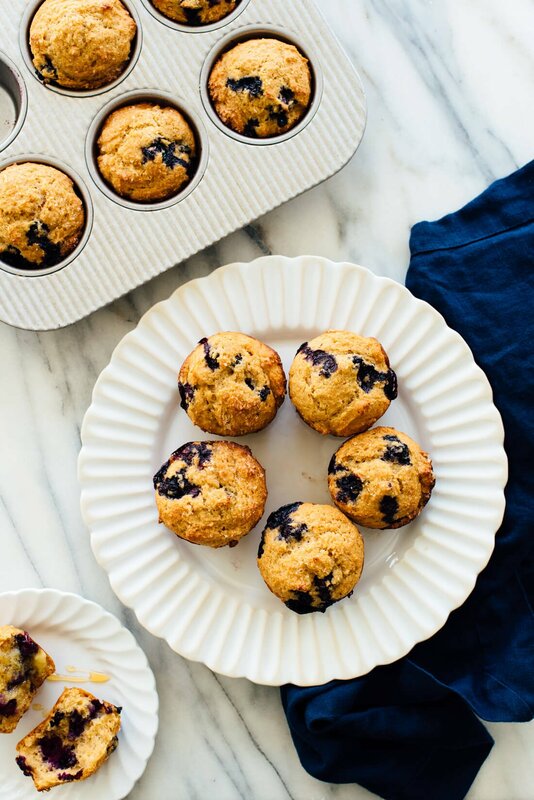 What makes these blueberry muffins healthy? 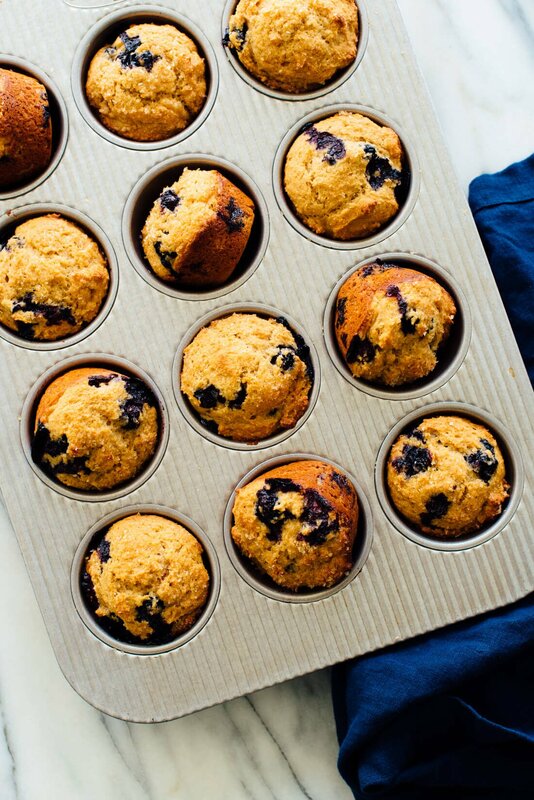 These muffins are more healthy than your average blueberry muffins. They’re made with 100 percent whole wheat flour (I used white whole wheat flour, which you can hardly taste). Whole wheat flour offers redeeming whole grain nutrients and extra fiber. 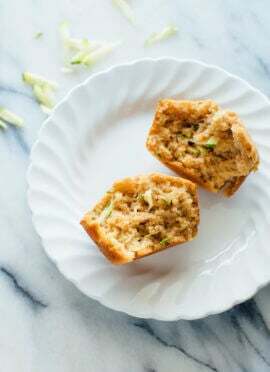 The muffins are also naturally sweetened with honey or maple syrup, which lend subtle honey or maple flavor to the muffins. They’re lower in overall sugar content compared to coffee shop muffins. Last but not least, I used Greek yogurt instead of sour cream, which lends the same irresistible tang but with more protein and less fat. I don’t think that yogurt passes for sour cream on tacos, but it totally works in muffin recipes. 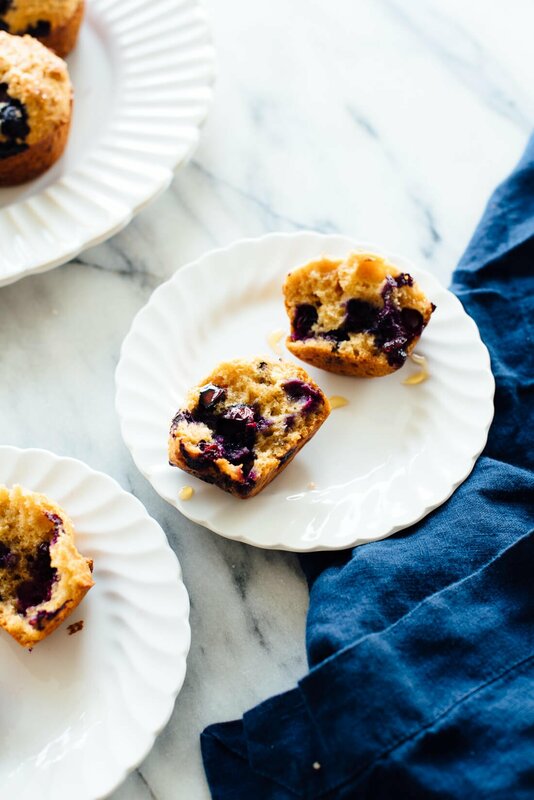 You can make these muffins with fresh or frozen blueberries. Do not defrost frozen blueberries before using; just stir the frozen blueberries into the batter as directed. Tossing the blueberries with one teaspoon of flour prevents them from sinking to the bottom. 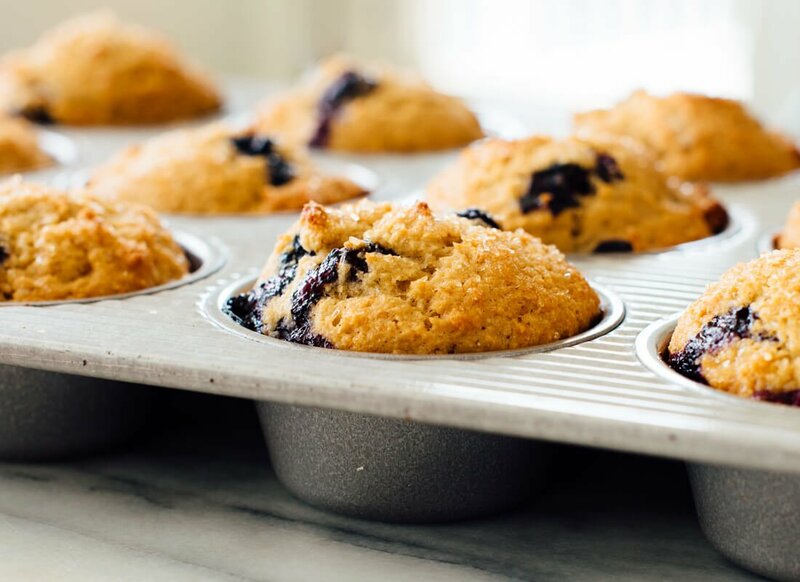 This way, you can use a full cup of blueberries without risking the integrity of the muffins. Sprinkling 1 tablespoon of raw sugar on top of the muffins before baking yields deliciously sweet, crackly muffin tops. You can buy raw sugar in the sugar aisle of most grocery stores these days, or just grab a few extra raw sugar packets from you go-to coffee shop (I won’t tell). These muffins taste best after they’ve had time to cool completely. Or better yet, let them rest for a couple of hours at room temperature before serving. This is true for most baked goods! I love this sturdy, made-in-the-USA muffin pan (affiliate link). I don’t ever have to grease it, thanks to the silicone non-stick coating. Clean-up is a breeze, too. I’ve never had to soak or scrub on this pan. 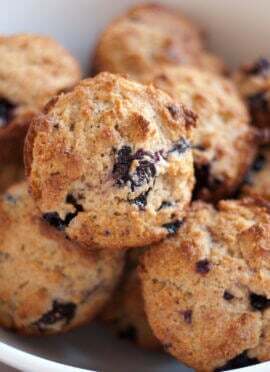 These healthy blueberry muffins are golden, fluffy, moist and delicious! No one will guess this recipe is made with 100% whole wheat flour and naturally sweetened with honey or maple syrup. Recipe yields 12 muffins. Preheat the oven to 400 degrees Fahrenheit. If necessary, grease all 12 cups on your muffin tin with butter, coconut oil or cooking spray (my pan is non-stick and doesn’t require any grease). In a large mixing bowl, combine 1 ¾ cups of the flour with the baking powder, baking soda, salt and cinnamon. Mix them together with a whisk. Pour the wet ingredients into the dry and mix with a big spoon, just until combined (a few lumps are ok). 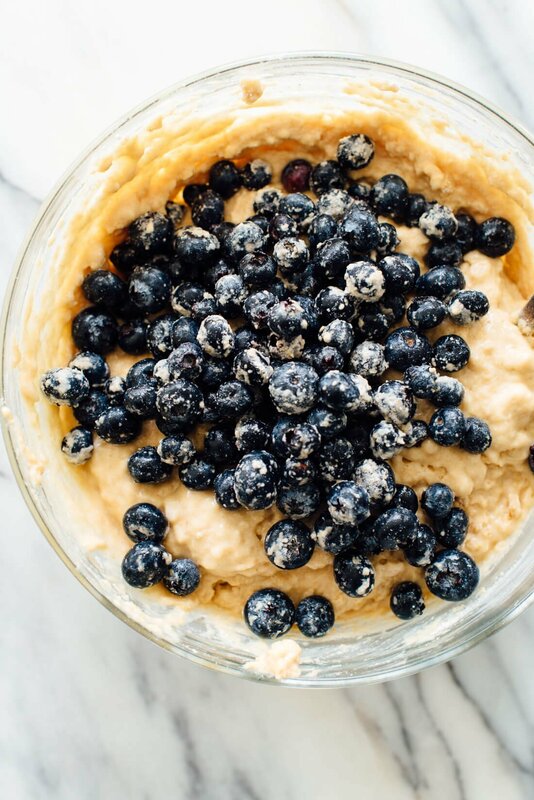 In a small bowl, toss the blueberries with the remaining 1 teaspoon flour (this helps prevent the blueberries from sinking to the bottom). 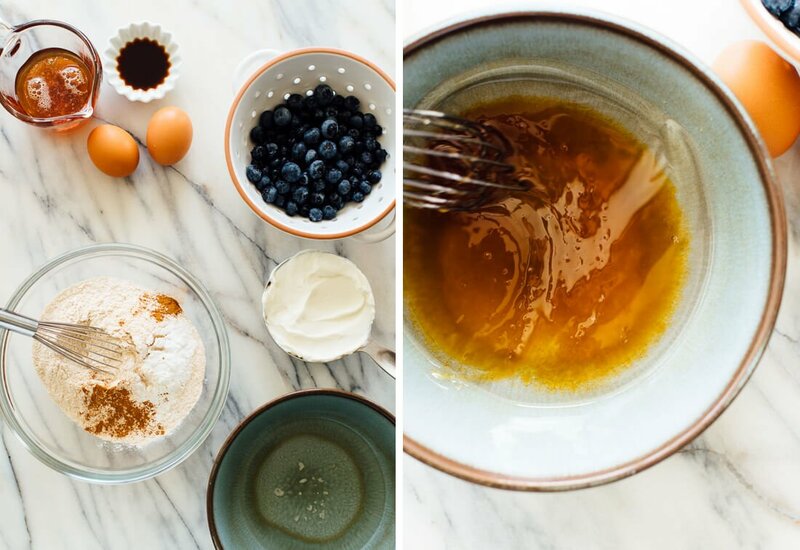 Gently fold the blueberries into the batter. The mixture will be thick, but don’t worry. Divide the batter evenly between the 12 muffin cups (I used an ice cream scoop with a wire level, which worked perfectly). Sprinkle the tops of the muffins with turbinado sugar. Bake the muffins for 16 to 19 minutes, or until the muffins are golden on top and a toothpick inserted into a muffin comes out clean. Recipe adapted from my blueberry maple muffins (recipe available in my cookbook) and lemon raspberry muffins. Lemon variation: For lemon blueberry muffins, whisk the zest of 1 medium lemon (about ½ teaspoon), preferably organic, into the liquid ingredients. You could even double that amount for extra-lemony muffins. 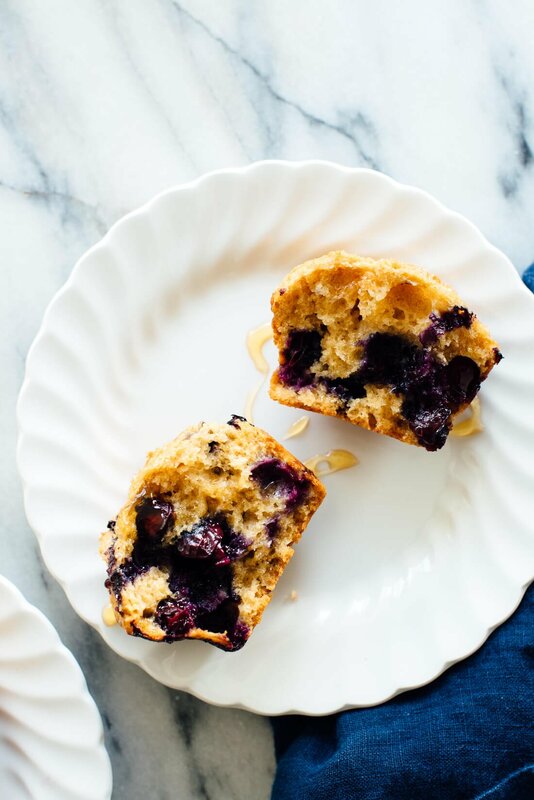 Change it up: You can substitute 1 cup of any other muffin-worthy fresh fruit for the blueberries. If you’re using strawberries or other large fruit (like peaches), chop them into small pieces first. 2/18/19 note: I’ve changed the baking temperature from 350 degrees Fahrenheit to 400, and reduced the baking time from 22 to 24 minutes to 16 to 19 muffins. These changes improve the muffin texture (less spongey in the center) and produce more irresistibly golden muffin tops. Hi Tia, you can use regular (not Greek) plain yogurt instead. Your muffins might not rise as high. Or, check the vegan notes under the recipe if you’d rather use buttermilk. These muffins look delicious!! I have some greek yogurt to use and am looking forward to trying these this afternoon! 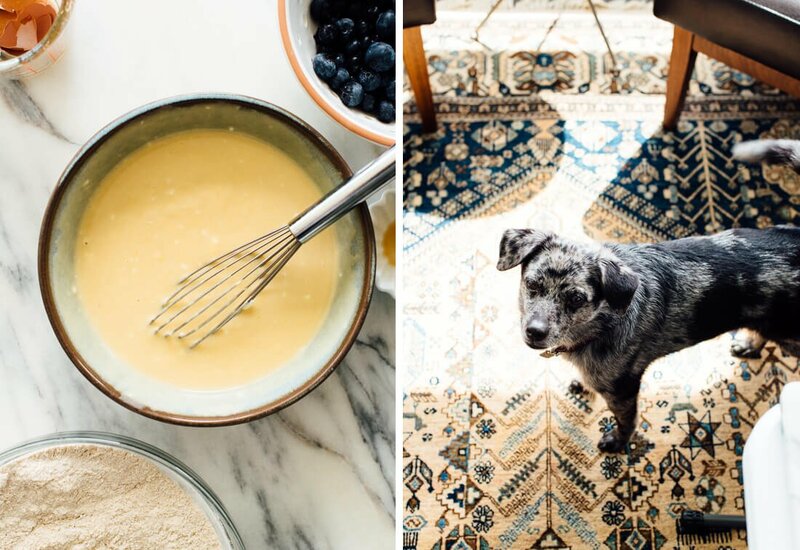 More importantly, please tell me what that fabulous rug is that your pup is standing on in the above pics! Thank you! Let me know what you think! That’s actually a rug I got from one of my trips. It’s vintage from Morocco, imported by yours truly. These are honestly the best muffins I’ve ever made in my whole life. I don’t even know what else to say, these are ridiculously perfect and they make EXACTLY 12 muffins?! WTF kind of magic is that even?! I’m in love!! Thank you! Just made these today. Hubby and I are trying to eat healthier and we live blueberry muffins, so I figured I would give this a try. It’s definitely a keeper! Muffins are moist, fluffy and flavorful. Thanks for the recipe. You’re welcome, Kathie! Thanks for your review! Literally the best muffins I have ever made. I’ve even put dark Lindt chocolate in them too! Great, Jess! Thanks for sharing. Well I must have done something wrong. The batter was more like cookie dough so I added a few tbs. of almond milk. Still had to spoon the batter into the tin. They came out more like cornbread than light muffins. I used ww flour, greek yogurt, honey etc. I’m not a baker so I tried to follow your directions exactly with poor results. What could i have possible done wrong? Hi Allison, I’m sorry to hear that! How did you measure your flour? I always spoon flour into the measuring cups and then level off the top with a knife. If you scoop flour directly into the cups, you could end up using significantly more flour, which would explain your difficulties. My only other suggestion would be to make sure you didn’t get the baking powder and baking soda quantities mixed up (it’s easy to grab the wrong container). Same thing happened to me. I rechecked the amount of flour and it was double the amount that a similar recipe had. So I doubled all of the other ingredients and the consistency seemed good. So once I added more of the wet ingredients the muffins turned out perfectly!!! I made and these (they didn’t last long) and then quickly made 2 more batches to freeze. They were awesome! Do you think adding poppy seeds, some lemon juice and zest to the batter might also be an option? What quantities might you recommend? I am new to the muffin baking game. Thank you! So glad you enjoyed the muffins, Matt! Lemon zest is a great idea (lemon juice is a tiny bit more tricky since you’re adding moisture to the batter, but zest is safe). I’d try 1/2 teaspoon zest. As for poppy seeds, I’d try 2 to 4 tablespoons, depending on how poppy seeded you want them. You can whisk both into the dry mixture. Have fun! Thanks Kate! I made these with the lemon zest and the poppy seeds as per your suggestions and they turned out great! Thank you so much! These were so good, Kate!! I went the lemon-blueberry route. So soft, fluffy, and perfectly sweet! These are so delicious!! We used maple syrup and half WW and half white flour and next time I will grease my cups a little more because they still stuck but A+ For final product thank you! These are fabulous! Moist, fluffy and healthy muffins in under an hour of work. Thanks for the awesome recipe! Thanks for sharing your experience, Mary! I’m so happy you enjoyed these muffins and the recipe was easy for you to follow. Just made these delicious muffins – so fast and easy! Don’t think there will be any left to freeze!! Just made these and they are delicious!!! Due to food sensitivities, I made a couple of changes. I used my GF flour blend and coconut yogurt and they still turned out great! I’m glad they worked so well, gluten free! Thanks for your review, Brittanie. I just made these and they were amazing! I don’t like too much maple flavor or too much honey flavor so I did half and half and it was perfect. I also used Pumpkin Spice instead of Cinnemon for a spicy kick :) love your site! That sounds interesting! Thanks for sharing, Katie. 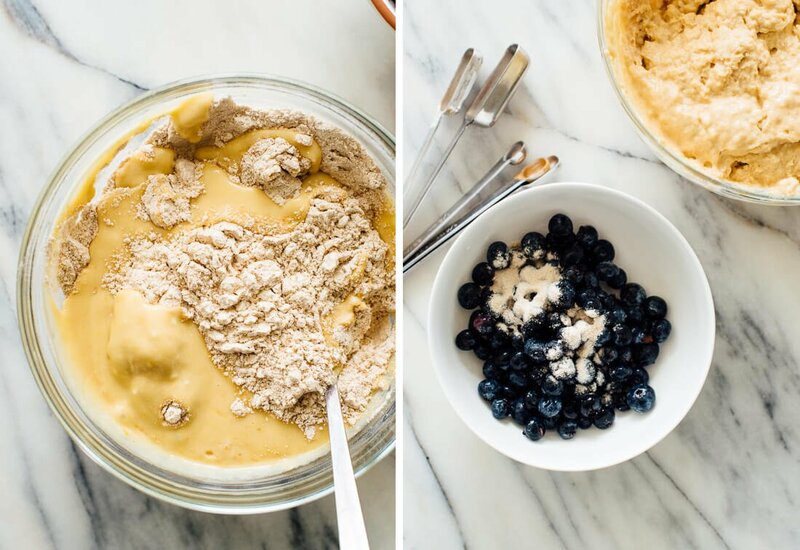 Pumpkin + blueberry. Thanks for sharing, Carlie! I appreciate the review. Hello! Looking to try this recipe out. Can I substitute agave syrup for honey? I use agave in place of the syrup. I use one third of a cup rather than a half. I just made these for a friend, but had to try one myself…..delicious! I followed the recipe exactly using evoo, maple syrup and skyr and they turned out beautifully! 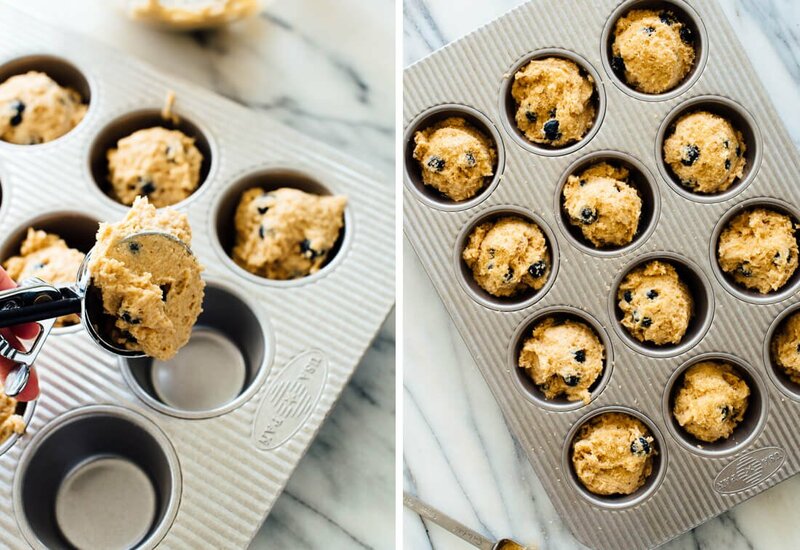 I’ll definitely be making these and your other healthy muffins again and again! These are freaking delicious!!! Will be making again (and again). Great to hear, Jasmin! Thanks for sharing. I just made this recipe from your book. They are awesome! I weighed the flour and honeyand used Almond “Buttermilk” and Chia Eggs. The recipe worked out really well. I’m really glad you like them! Thanks for the review, Maxwell. I just made these muffins and they have no taste. I used honey? No taste usually means no salt. Did you accidentally leave out the salt? You would be surprised how the salt brings out the flavor in almost all baked goods that require salt. These sound amazing but I would like to make them dairy free without the yogurt. I saw that at the bottom it said see buttermilk option above but couldn’t find anything. What could I use in place of the yogurt? I made these muffins with 1 cup raspberry Greek yogurt and I also substituted 2TBS flax seed for the eggs and they came out AMAZING!! I baked them for 20 minutes instead of 22. Delighted to hear it! Thanks Kim! So, I made these and your apple muffins today, but in loaf form! I’ve made both before and loved them as muffins, but I decided to do something different. Firstly, I made both vegan by using flax eggs and Anita’s Organic Coconut Yogurt, which is AMAZING, btw! For this one, I then included a relatively heaping 1/4 tsp. of the optional cinnamon, and added heaping 1/4 tsps. of cloves, cardamom, and ginger for additional spice; in both loaves, I used fine-grain himalayan pink salt. I was delighted to see the optional lemon zest variation, but I was rather lazy and didn’t feel like breaking out my zester, so, instead, I replaced the vanilla extract in the recipe with 2 tsps. of organic lemon extract! From there, I was thinking of what flavors would agree with one another, and decided to use organic, cold-pressed EVOO instead of the coconut oil I usually use in your recipes for a slightly herbal note I was thinking would complement the lemon, honey, and blueberry flavors (I also upped the 6 oz [170 grams] of berries to 183 grams for some added blueberry goodness!). Finally, like the apple loaf, I used organic erythritol in place of the turbinado sugar topping! Like the apple laof, I’m going to freeze this one and eat it when the craving hits. All in all, not bad for being done around 9:30 am! Thank you so much, Kate, for such amazing recipes! Thank you for sharing, Alex! I’m happy to hear you love these so much you wanted to experiment. I appreciate the review! I”m so sad, these didn’t work for me! They came out a mushy mess! I followed the recipe exactly except for one thing. I used almond flour instead of whole wheat flour. I’m not experienced in cooking with almond flour so maybe that doesn’t work for baking? Please advise! I also used frozen blueberries but I defrosted them first. Maybe they were too wet still? I’m so disappointed. I’d love to know what your thoughts are on this. Thank you! Hi Sue! I’m sorry these didn’t turnout perfect. Yes, the almond flour would really impact the result. wonderful! I actually used 1 cup of unsweetened applesauce instead of any dairy since I’m lactose intolerant and they came out perfect! Very tasty and moist. I will definitely save this recipe and use it again. They are perfect and my granddaughter and I just love them. If made according to your recipe, approx. how many calories per blueberry muffin? Hi Kate, thank you for all the work that you do! I always cooked with the idea of “wholesome” foods but since I discovered your blog two years ago, I have GREATLY expanded my flavor profile. Hi, Ella! I’ve made these before using Bob’s Red Mill Organic Whole Wheat Pastry Flour when I didn’t have normal white whole wheat, and they turned out beautifully! Sorry if this is too late to be of any use. Kate do these freeze well? Looking forward to trying. THIS SO SO AMAZING! Everything about it is great! If you would give them a name what would they be? I’d love to have a go at baking some of these muffins but can you tell me the calorie content please? Hi Beverlery! The nutrition information is below the notes section of the recipe. Make sure you allow pop-ups as this is a plug-in on my site. Surprisingly good! Love the sprinkle of sugar on top, texture was great too. Smushed in a few extra berries in the top before baking. Is whole wheat flour supposed to have a bit of a bitter taste in some bites?…..haven’t cooked much with it. Hi Angela! Thanks for trying this recipe. My guess with the bitter taste is that you didn’t get your mixture evenly mixed and might have had some clumps. I appreciate the review! I use this recipe at least a couple of times per month. I love the fact that it uses honey or maple syrup (I use honey)and Greek yogurt. Between my husband’s work crew and my friends at Bible study, I never have any to freeze! They’re all eaten within a day or two. I’ve recommended this site to friends, for I have many that like the more healthful recipes. Keep up the good work! I actually get 18 muffins out of the recipe (which is great, considering they’re so popular). Hi! This recipe looks absolutely amazing! My family doesn’t really love the taste of honey or maple syrup though (I do, but I’m the only one with a sweet tooth in the family). I was wondering if it would be okay to substitute the honey (or at least part of it) with applesauce (homemade and sugar free, of course!!) or if it would be better to add a bit of brown sugar. I don’t want to mess with the dry/moist ingredient ratio too much and end up with very dense muffins that don’t rise or with super dry ones! I made these and all of them stuck to the paper muffin liners! Do you not recommend using liners or is it just because the muffins are so moist? Thanks! Oh no! I’m sorry to hear that, Natalie. I don’t recommend using liners with my pan. If you need to use liners, try very lightly greasing them or just grease the pan some. I’ve made these muffins at least10 times now, and my family LOVES them! Thank you for this healthy and delicious recipe. They’re one of the best! You’re welcome, SV! I’m glad these are a go-to. I’ve made it twice already! These come out lovely! Nobody can stop eating them! Kind of disappointed with the outcome of these muffins- which is shocking to me because every other recipe i’ve made from this site has been beyond wonderful! I followed the recipe to a T, except had to use half melted coconut oil and half virgin olive oil (ran out of coconut oil). They smelled wonderful when baking. I brought one to work today for breakfast, it was so dense! I thought it would be fluffier for some reason. It also has a metallic-y taste to it? I’m not sure where this is coming from. I even used paper muffin cups in my muffin pan. The blueberry flavor comes through, but for adding all of the maple sugar, they are pretty bland flavor wise. Maybe more cinnamon? Dash of allspice? Lemon? Something is missing, and I didn’t find eating my muffin very enjoyable at all. Was excited for the “healthy” aspect of it, but would rather have consumed the fat/calories with a normal blueberry muffin and enjoyed it, than the flat-ness of this one. Kate, do a re-do recipe on this, please! Hi Adrianna! I’m sorry you didn’t love these. The mixture of the two oils could have made an impact. For the aluminum taste, did you make sure to use aluminum free baking powder and were both the baking powder & soda fresh? If any of those things can give that taste. Thanks for the feedback! Just made these with my 3 year old – huge hit! Love them. We opted for the cashew milk and vinegar option instead of yogurt (my first time making a substitution like that) and they are very tasty! Thank you! Well it sounds like it worked well, Amy! Thanks for sharing what you did and that it was a hit. I appreciate the review. Yum so good! I added a hint of pure almond extract to compliment the cinnamon. These were super yummy, great for a grab and go breakfast. I’m happy to hear that, Refraxis! Delicious! 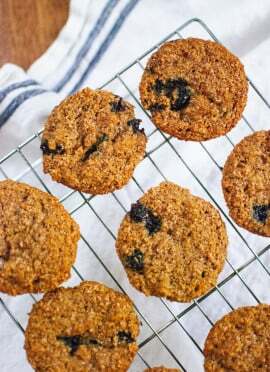 My toddler usually doesn’t like blueberry muffins but he loved these and I love it when he reaches for healthier alternatives. I did find the olive oil to be a little more prominent than I would have liked so maybe will use coconut oil next time or try the olive oil and syrup combo (we used honey). Also I only had vanilla greek yogurt on hand and despite the fact that it’s a little sweeter, I kept the extract the same–I am glad I did as the recipe was perfectly sweet so the vanilla flavored yogurt didn’t really matter. Will definitely make again! Parent win! I’m glad he likes these. Those substitutions should be ok. Let me know what you think when you try it next time, Andrea! Wish I would have seen your note bait the updated cooking time & temp before I made these. They were really good but would have prob liked them more a little less spongy. Can’t wait to make again! I absolutely love this muffin recipe! The blueberry muffins turned out fantastic! I also used the base recipe and added apple + cinnamon which turned out really nicely. I made your carrot cake too (it was awesome). I was thinking of turning them into cupcakes! Thank you for letting me know you love them, Alison! My family has fallen in love with these blueberry muffins! A great problem to have, Kara! Thanks for the review. Love these muffins!! How would I adjust for making mini-muffins? Hi Janet, I have never tried! I would look at other comments to see what people recommend if they have tried it. My guess is to shorten the timing and keep a close eye. TOP NOTCH! These are divine — can’t believe it’s 100% whole wheat. I added a good bit of hemp seed and a little applesauce (applesauce wouldn’t have been necessary if I didn’t add so much hemp). For some reason, these made a lot more for me than I expected — 19 standard muffins. I reduced the baking time a bit (mine must be smaller than the recipe indicates). LOVE THIS RECIPE – fluffy, lightly sweet, tender. Thank you! I know, right! I’m so glad you love them. Thanks for the review, Abby! Would I be able to substitute the eggs with mashed ripe banana instead of flax eggs? Unfortunately, I don’ think that will work well as the egg helps as a binder. This is my first recipe I tried from this site. The.muffins are delicious. Recipe is easy to follow with no.complicated instructions. Definitely planning on trying more recipes of this one is an indication of how great they are! This is a great recipe to start with, Jennifer! Yummy..i made this and banana. What is calorie for both. I substituted apple sauce for oil and used syrup. I make your maple sweetened banana muffins or the pumpkin muffins every 12 days like clockwork and keep them in the freezer for an easy breakfast. I wanted to I use up some frozen blueberries so I thought I’d try something new. These were really good, too! I used sour cream instead of Greek yogurt because it’s what I had and it worked perfectly. I also swapped out 1 of the teaspoons of vanilla for fresh squeezed lemon juice. Delicious! I love it! I’m happy you are loving all the muffin recipes. :) I bet the lemon was nice! Just made theses & there where amazing, I was wondering would adding chopped hazelnuts Into it work well? You could try it! Thanks for the review, Lianne. Just made these today and they are delicious! A big hit with my family! Thanks for the review, Val! Just made these! We are trying to eat healthier so this recipe caught my attention. Muffins turned out delicious. I was a little short on the greek yogurt so I added sour cream. Went the coconut oil and maple syrup route. My husband is devouring one at this very moment. Didn’t even need to wait for it to cool! Thank you! I love it, Amy! Thanks for sharing. I’m glad sour cream still provided a good end result. LOVED these!!! My 3 year old has been asking for blueberry muffins all weekend, so we found this recipe and made them this morning. I ran out of vanilla, so I finished up w almond extract and delish!!! I’m happy to hear it’s a hit with you and the kiddos, Kristen! Thanks for your review. I have a toddler with a dairy allergy, these muffins are fantastic. I get additional veggies and fruits in her and its something easy to pull out of the freezer for breakfast. Thank you! You’re welcome, Kate! I’m glad they are a hit. These are the best muffins I’ve ever made! Delicious, moist and fluffy! Thank you for sharing this recipe! Are these muffins regular large size? Can they be made in to mini muffins to reduce calories ? Is the whole wheat flour plain or self raining ? It is not self raising. Hi, Kate! I made this recipe today, with all vegan options, and made it in 6 jumbo silicone muffin cups. The recipe came out very well! I was surprised at how high they rose. I substituted unsweetened applesauce for all of the oil, also. 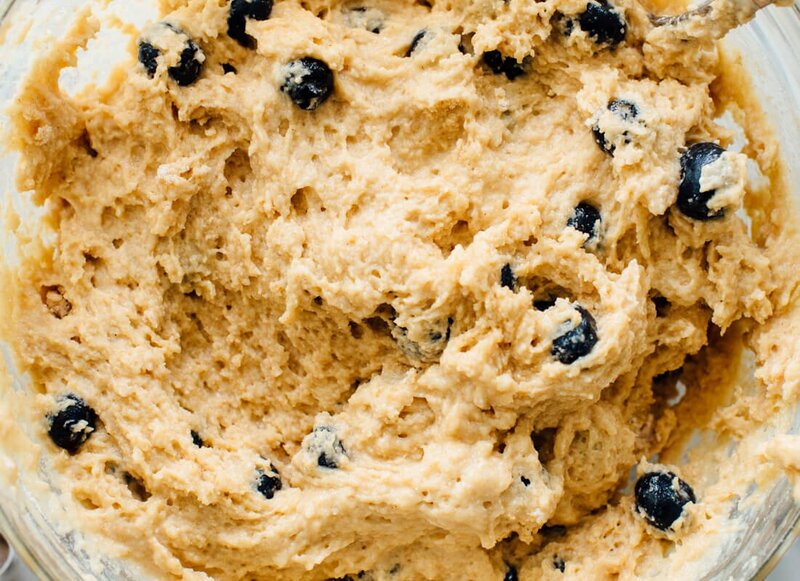 Next time I make these, I will skip the blueberries entirely and add equal amounts of raisins, walnuts and vegan chocolate chips for a completely different taste. Thanks for the recipe! Thank you for sharing your variation, David! My family loves these muffins!! We’ve taken them on trips for the car and quick breakfast options. This weekend I’m traveling and don’t have a muffin tin at our rental. Do you think this recipe would hold up in a loaf pan?? Might just make the blueberry lemon cake, since that is also a favorite recipe. ;) Thank you!! Do you think I can use oat flour for this recipe? I haven’t tried it, so I’m not sure. Bob’s Red Mill gluten free flour works well if you need it gluten free. Omg these are great!! I used 3/4 cup of whole wheat flour and 1 cup all purpose. I also used 1/2 organic maple syrup and 1/2 organic honey. I also only had one of those mixed berry Greek yogurts in the fridge. You know those “fruit on the bottom” ones. It came out sooooo good!! I topped with course coconut sugar and they came out nice and crispy. Because these are semi healthy, I won’t feel so bad eating them all myself. Thanks for sharing your variation, Chelsea! I’m glad you loved it! I made this today with blackberries and lemon. They are delicious and were baked perfectly at 16 minutes! I just followed the recipe, easy, seriously foolproof and delicious, not too sweet, perfect for breakfast! These were great! I put more blueberries in which still worked out well. I also love the strategy of coating the blueberries with flour to prevent them from sinking during cooking – worked like a charm! The muffins are amazing! They have the just right amount of blueberries and aren’t to sweet! I’m glad you love them, Audrey! Thanks for your review. They turned out great! I doubled the recipe to make HUGE muffins (cooked a little longer). I also used one cup honey and one cup maple syrup with the fat free Greek yogurt and olive oil, and whole wheat flower! Pretty good! Would love to make these tonight but don’t have any whole wheat flour. Can I use all purpose flour? the same amount? Hey Olivia, yes, all-purpose should work just as well! Same amount. Muffins look great, but fat’s not the issue, it’s sugar that makes us fat. Watch Fed Up. I will give these a try, thanks! I made them for the Santa Cruz VegFest, added lemon and made them vegan, as your recommendations. They were a big hit! Every time I make one of your muffin recipes my kids declare them the BEST EVER! These turned out very moist and fluffy. Love them. I used Skyr yogurt instead since its what I had on hand. These tasted great! Super easy too! I used 1 tsp. almond extract and tsps. vanilla. I also added another 1/2 cup of blueberries (used fresh). One of my favorite recipes for muffins. I ran out of plain greek yogurt and used vanilla greek yogurt instead and they were even more delicious! Love this recipe. HEALTHY BLUEBERRY MUFFINS. I put in 1/2 cup of almond flour and the rest Whole wheat. One of my favourite recipes. Thank you!! I’m glad you love it, Marilyn! I have tried SO many recipes from your blog and all have been fabulous! I literally come here and search for specific recipes before I look anywhere else. Simply because I know your recipes will always turn out great! These muffins were no exception! Just what we wanted for a Saturday morning breakfast and healthy ingredients that I always have in my kitchen! Some of my family’s other favorites are your zucchini and banana bread recipes. Yum! I love to hear that! Thanks for stopping to comment, Melinda. The nutritional information has been deleted somehow. Could you please replace it? May I know if we really have to use yogurt? Can we not use it? It helps with the moisture, flavor, making them fluffy and the nutritional content. I would recommend keeping it as I’m not sure how they would turn out without it.